This lovely little bear is Gooseberry, he is 3 1/2" tall and is one of the latest bears in our Fruits Collection. 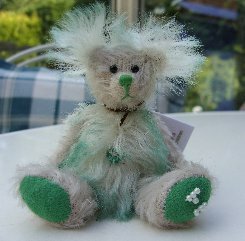 He is made of short, quite flat, stone coloured German mohair whilst his tummy and ears are made of much longer white backed, wavy, green tipped silky mohair. The contrast is great and gives Gooseberry brilliant ears! He has bright green ultrasuede pads and paws, a green stitched nose and shiny black German glass eyes. We have filled him with steel shot for weight and so he is nice and heavy for his size. I really like him, I think he is very cute, I hope you like him too. Gooseberry costs £36 plus postage.